Christine Chiu of Colorado State University investigates clouds. She calls them "complicated 3-D objects that evolve fast." She studies clouds from below and on all sides with scanning cloud radars and from above with satellite data. Her research matters. Cloud properties are the prime determinants of the Earth's energy budget, yet are not represented well in current models. The disconcertingly wide range of present-day earth system predictions, Chiu says, "is partly a result of inaccurate cloud properties in climate models." 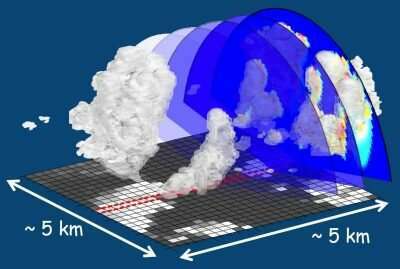 To improve models, it's necessary to better understand the physical processes and radiative effects of clouds and precipitation. To that end, Chiu and colleagues in Colorado, the United Kingdom, and Finland began work in July 2018 on a three-year research project that addresses an enduring puzzle of cloud microphysics. Why does the observed concentration of ice particles in a cloud system often exceed, by several orders of magnitude, the nearby number of primary ice nuclei? In sum, why does so much ice in clouds get made from so few apparent ingredients? Scientists have a name for this unexpected enhancement of ice particles: secondary ice production, or SIP. In the past 70 years, researchers have hypothesized many mechanisms that could explain SIP, as outlined in this 2017 review paper in the Bulletin of the American Meteorological Society. The three mechanisms of primary interest to Chiu, the project's principal investigator (PI), get a lot of attention in current discussions. But it is not clear which is the predominant one, or how SIP initiation and formation varies with cloud types. Chiu and her team intend to confront these and other SIP process questions, and (importantly) to discover how these processes affect radiation and precipitation. Their research project—to assess SIP in continental clouds—is funded by the U.S. Department of Energy's (DOE) Atmospheric System Research (ASR) program. Chiu has been part of ASR research almost continuously since 2006. Among the three SIP mechanisms Chiu focuses on is one that was first hypothesized in 1943. Rime splintering occurs when large riming ice particles like snowflakes or graupel (snow pellets) collect supercooled liquid droplets, generating numerous splinters of ice. Frozen-drop shattering takes place when larger droplets freeze, then splinter. The lower the temperature, the higher the rates of shattering. Ice-ice collision, the third hypothesized SIP mechanism, happens when fragile ice crystals, coated with thin needles or slender dendrites, break up easily during collisions with one another. Some observations and model simulations have suggested that the three SIP mechanisms may happen together, says Chiu—but under what conditions? "The microphysical processes are way too complicated." Additionally, is SIP the most important process of all? "People don't actually know," she says. "But knowing the beginning of ice particle concentration is an important place to go." To begin getting some answers, "we're cracking data now," says Chiu. 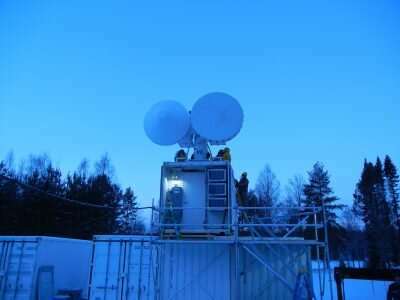 The data are from a 2014 field campaign in Finland called Biogenic Aerosols—Effects on Clouds and Climate (BAECC), supported by DOE's Atmospheric Radiation Measurement (ARM) user facility. BAECC was designed to obtain important details on processes related to aerosol, cloud, and snow formation that are not currently well understood or well represented in earth system models. During the field campaign, researchers deployed coincident multi-instrument measurements, a first during a field study of snow and ice microphysics. Other instruments provided the comprehensive aerosol measurements Chiu needs to calculate the number of primary ice nuclei. "Without knowing the concentration of primary ice nuclei," says Chiu, "we won't be able to know if 'secondary' ice production occurs." 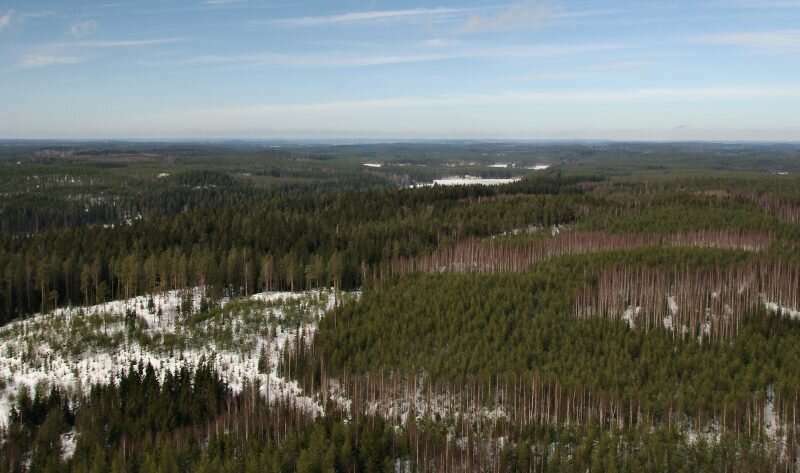 Measurements during BAECC were collected in the frigid reaches of Finnish boreal forests, often during conditions of deep clouds and heavy rain—which is useful to the ASR project mission. "Secondary ice production is believed to occur at a rather narrow temperature zone between minus-3 and minus-15 degrees Celsius," says Chiu. "We wanted to increase our chances of observing that ice production. High latitude is our ideal environment." The unique, first-time multifrequency radar measurements made during BAECC comprise one of the most complete radar data sets in the ARM archive, she says, but the data have not yet been fully exploited. Two BAECC-data veterans from Finland are collaborators in Chiu's present ASR project: Tuukka Petäjä of the University of Helsinki, and David Brus from the Finnish Meteorological Institute. Fittingly, Chiu is joined by CSU's V. Chandrasekar, an internationally known authority on radar systems and co-PI of the ASR project. "Radar data plays an important role in this project," she says. "Chandrasekar will help us get the best out of these radar observations." To achieve the highest data quality for the cloud retrieval method, Chiu also works closely with ARM radar instrument mentors Bradley Isom and Nitin Bharadwaj. Both are at Pacific Northwest National Laboratory in Richland, Washington. Another CSU colleague will help in the ASR project. Susan van den Heever, an expert in cloud microphysics, oversees the Regional Atmospheric Modeling System, or RAMS. The model will be used to evaluate the results of the project. Van den Heever says that secondary ice processes play a big role in "precipitation production, cloud-radiative forcing, and anvil dynamics." All the more reason to understand them better on a process level, she adds, and to represent them in research and forecasting models. To set the project in motion, Chiu wrote the science questions as well as the cloud retrieval algorithm. Once she and the others are confident about their cloud retrieval, they will run RAMS to test their new understanding of SIP. "If successful, we will come up with more accurate secondary ice parameterizations," says Chiu. "That will lead to models that better predict ice water content and radiation." In the end, she hopes the project will help improve how ice microphysics is represented in models and therefore reduce errors in estimated global precipitation and radiation. The team's goal is to fill in critical knowledge gaps about microphysical processes, says Chiu. "Clouds are still in many ways mysterious." The wider mission for the project is to call attention to the need for long-term, frequent, robust observations for characterizing SIP processes. Historically, evaluating rime splintering and other SIP mechanisms depend on observational data from aircraft. But Chiu and her team are devising a method to also incorporate ARM's powerful ground-based radars to better quantify ice particle concentration. Incorporating radars to solve the SIP puzzle "is a high-risk project," she says. "It's really new. We're trying to retrieve something in ways no one has ever done before outside of a laboratory or aircraft data." In some of her earlier ASR research, Chiu took methodological leaps in retrieving microphysical and optical properties, using what she calls "synergistic" measurements from cloud radar, lidar, and shortwave spectrometers. Chiu finds ways to take advantage of how clouds and radiation affect remote sensing observations. For example, she combined solar radiation measurements and radar slices to retrieve high-resolution, three-dimensional cloud fields for the first time in both overcast and broken-cloud situations. She calls that "a key step to improving our understanding of cloud life cycles and cloud organization." Chiu and her colleagues also developed a novel method of simultaneously retrieving vertical profiles of both clouds and drizzle. It is well known that drizzle often dominates observed radar reflectivity. They proposed a way around that while using active remote sensing on marine boundary layer clouds. The data came from eight transects of the Pacific Ocean by a Horizon Lines container ship fitted with atmospheric instruments during the Marine ARM GPCI Investigation of Clouds (MAGIC) field campaign of 2012 and 2013. Chiu has also done field research in the Azores, serving as a co-investigator for the Aerosol and Cloud Experiments in the Eastern North Atlantic (ACE-ENA) campaign. The study of low clouds and marine boundary layer aerosols took place in summer 2017 and winter 2018. "I find the intertwined interactions between drizzle, clouds, aerosols, dynamics, and radiation fascinating," says Chiu. The courage to face risks, and to travel far to achieve her goals, has characterized Chiu's life so far. Born in Taiwan, and good early at math and physics, she took her first scientific risk at age 13. Still in junior high school, she had a question on chemistry and boldly mailed it to the legendary Wu Ta-You, now known as the "Father of Chinese Physics." He wrote back a 10-page handwritten answer. It shook her with joy. "You can imagine how I felt," says Chiu. "He listed several arguments and explained how to solve the question. It was the first time I saw that knowing the answer may not be the most important thing—that the process itself is more fun!" She adds: "I was just a little girl from a not-so-well-developed town, so his letter really inspired and touched me. I am always grateful for that." Bachelor's degree studies at Taiwan's National Central University gave Chiu her first taste of atmospheric science—an interest that sprang up after she realized she could not be an astronaut, her first science love. "I am severely nearsighted," she confesses, "and get motion sickness." At Purdue University in Indiana, Chiu earned her Ph.D., which took her deep into satellite observations for precipitation. As a postdoctoral researcher, she joined the Joint Center for Earth Systems Technology at the University of Maryland, Baltimore County. At the same time, Chiu was a researcher at NASA's Goddard Space Flight Center. Her time at Goddard, says Chiu, "really shaped my whole career," in part because of her mentors, Warren Wiscombe (now retired) and Alexander Marshak. Since the fall of 2017, Chiu has been an associate professor at CSU, where her research group investigates remote sensing, radiative transfer, and the interactions of clouds, aerosols, precipitation, and radiation. At the same time, she sees clouds for what they also are: beautiful. "I do enjoy, intellectually, working with observations," says Chiu. "But I never look at clouds and wonder how many droplets they contain."